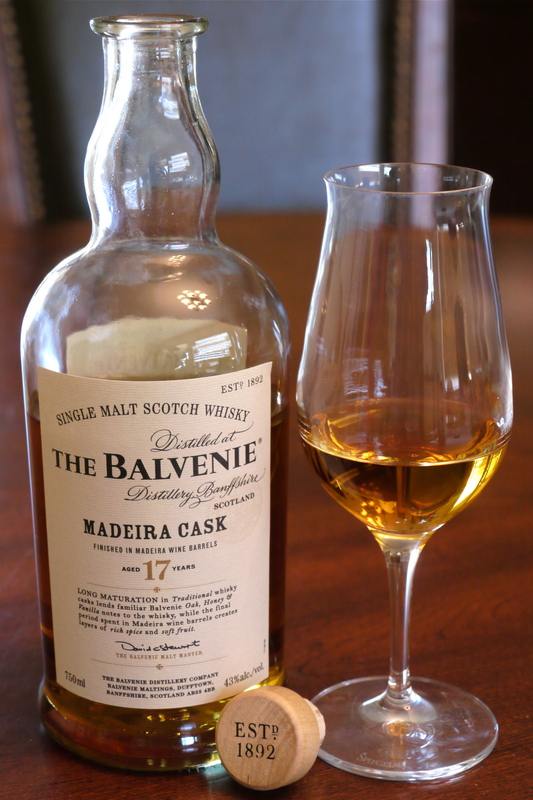 The Balvenie 17 Year Madeira Cask – Merry Christmas to me! This past holiday season was a great time to be an amateur whisky blogger. Marketing companies are into social media big-time these days. In addition to starting up Facebook pages, blogs and company-owned Twitter accounts, they’re reaching out to “real people” with these same types of accounts to get their message out. Around the same time I was contacted about receiving samples of JW Blue and Chivas 18 for review, I was contacted by a PR company representing The Balvanie, wondering if I was interested in trying out this year’s 17 year special release, finished in Madeira [fortified Portuguese wine] casks. Yes! Ok, after 2 weeks of a head/chest cold followed by a couple of healthy days, and then a week with a stomach virus…here, finally, are my tasting notes on this Christmas present. Not that you were dying to hear my take on it, but it’s been frustrating for me. Nose: This is easy to nose, with the alcohol staying out of the way. Sweet spices hit me straight away. Cinnamon & sugar for sure, and maybe I’m influenced by other tasting notes I’ve read, but I’ll go with nutmeg as well. It’s also reasonably fruity. Perhaps some apple, but it’s more like baked apple, not a fresh/crisp fruit. Also more than a little raisin. Finally, a rich vanilla comes through, and as I pull away, just a hint of fresh oak. Note: On a couple of occasions, I felt there were some chocolate/orange on the nose, not unlike that part of the Dalmore 12 profile. However, the above notes represent a more consistent picture of what I’m getting from this bottle. Palate: More than most other whiskies I’ve tried, the nose prepared me perfectly for the mouth experience. Sweetness is quickly balanced by fruit and followed by the spices. There’s a bit of spicy tingle, but it’s pretty tame. I wouldn’t call this heavily bodied, but it’s not watery either. Finish: No surprises on the finish. The taste just carries straight on through and slowly fades after a medium duration. Perhaps just a bit of added maltiness lingering at the end. With other Balvenies I’ve tried, there has been a little bitterness on the finish (not necessarily in a bad way), but there’s none of that here. There is some marginal drying on the finish. Score: 87/100 (B) I’ll still reach for a peated malt most of the time (even lightly peated like HP), but for a Speyside that’s not heavily sherried, this ranks pretty high for me. Bottom Line: Very impressive Madeira cask integration, providing an extremely balanced and accessible whisky. The Madeira finish provides some nice spices that you don’t get every day with a Speyside scotch, without blocking out the fruitiness of the spirit. Enjoyable from start to finish. Score higher if: You’re a big Balvenie fan to begin with, and/or Speyside is your favorite scotch region. Score lower if: It’s all about peat and/or big sherry for you. This one won’t change your mind about more subtle Speyside offerings. Value: This is definitely a step above the younger, very nicely priced Balvenie expressions. I think the Edinburgh Whisky Blog hit the nail on the head when they put this in their Christmas Gift Guide, as it would make an excellent gift, and appeal to both the occasional drinker and the connoisseur. At $120, though, I don’t see a lot of people buying this by the case. To consider the premium Bavenie expressions “values”, I’d want to see the Bavenie 21 year Port Wood come back down below $150, and these 17 year releases at or below $100. I did some direct comparisons with the 15 year Single Barrel and 12 year Doublewood Balvenie expressions. You can definitely taste the family resemblance when comparing to the Doublewood, which brings fresh apples, vanilla, some spices and a bit more oak to the nose. The Madeira takes this base profile to the next level. Everything is richer and smoother. There’s less fresh oak, but the vanilla is much richer. The 17 year also brings those additional spices from the Madeira cask. As for the 15 year, it’s got HUGE fresh oak. I like oak with stronger whiskies (Laphroaig QC comes to mind), but it’s almost too much for me here. I definitely like the way the finish tones this down in the 17 year Madeira expression. I also find the 15 SB to be much more “spirity” than the Madeira Cask, with the alcohol being more prominent on the nose. My first dram of Balvenie 17 year Madeira immediately called to mind the Glenmorangie Quinta Ruban, a 12 year finished in port casks. Madeira and port casks, both having previously housed fortified wines, seem to offer similar contributions to the whisky, at least where the spices are concerned. 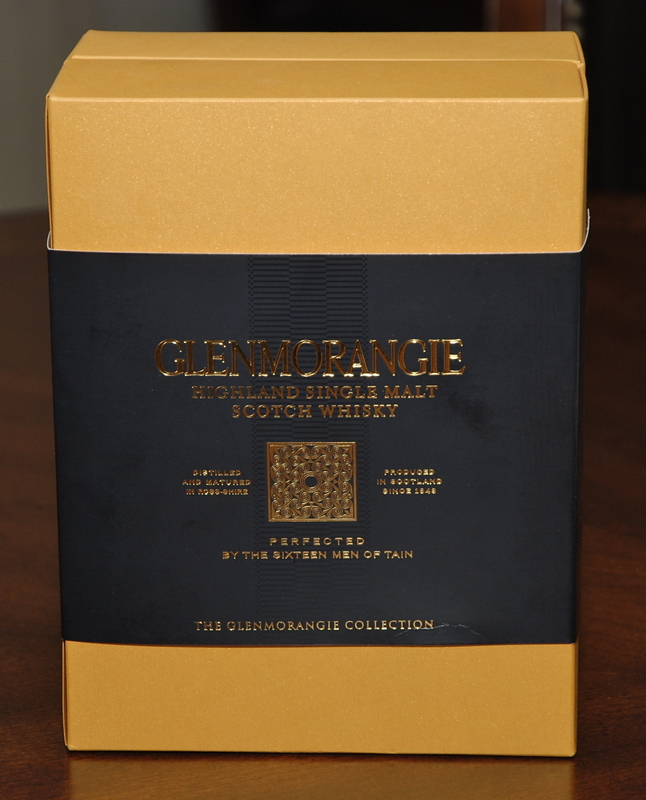 I’d love to see a review of this expression by Serge over at Whiskyfun. He doesn’t seem to be a big fan of the Glenmorangie finished expressions. However, to my [admittedly much less experienced] palate, this finished Balvenie feels very nicely integrated and balanced. Much less “constructed” than the Glenmo bottlings. That being said, I like the Quinta Ruban very much, and it does manage to scratch the same itch for me that the Balvenie Madeira does at a 60% discount in price. What Does John Know (Malt Advocate): – John was impressed by the balance of this whisky and awarded it a very impressive 90 points. I probably could have just copied and pasted his notes to represent my own findings. Dr. Whisky: The good Dr. considers this one of the best in the Balvenie 17 year series. whisky-pages: They also mentioned the shift from fresh fruit with their “stewed apples” reference. Edinburgh Whisky Blog: Definitely some different references in the tasting notes, but I can see where they’re coming from. Drinkhacker: An A- rating, but with a disclaimer that some might be put off by the Madeira finish. Perhaps, but I still think this is an amazingly accessible whisky. discover whisky: Why wasn’t I aware of this blog already? I really like their notes in this review. I think this is my first repeat review, but I’m going to change my rating on this one, so I wanted to write about it again. 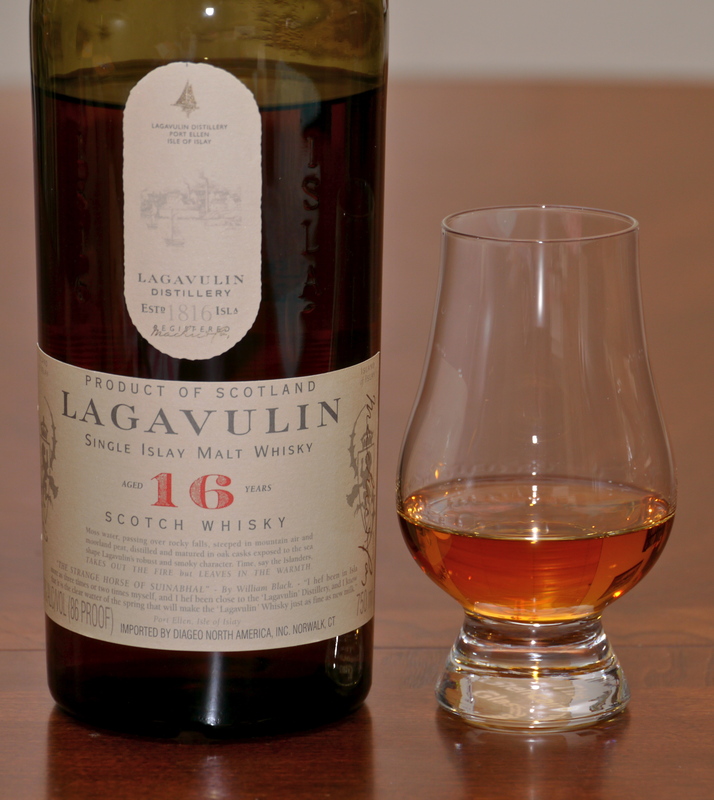 I’m talking about Lagavulin 16 (43% abv), this one bottled in 2009. This expression is surely matured in a mix of bourbon and sherry casks, but I can’t find any concrete description of their “recipe” like HP provides for their various expressions. 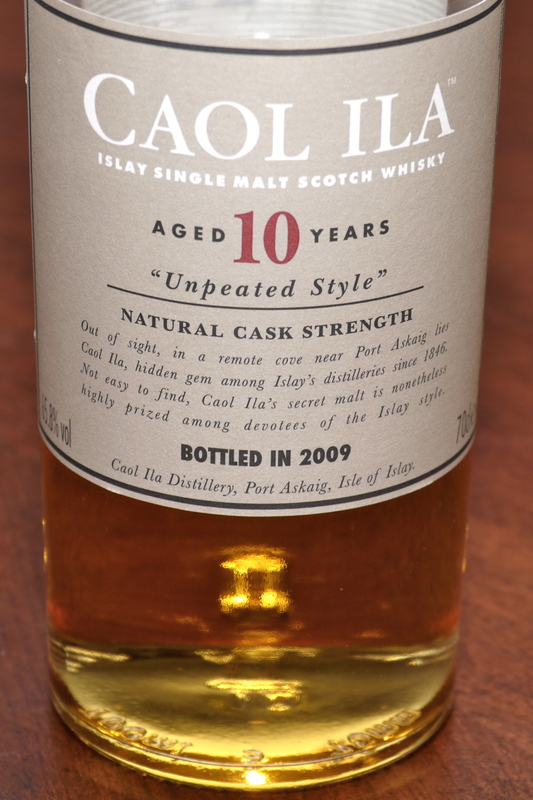 My previous Laga 16 review was based on a 200ml bottle from 2006 that came with my Islay Collection pack. The price of this well known Islay single malt has dropped at the local big box liquor store (in AZ) from $80 to $70, more in line with California pricing. I hope it stays that way! Nose: Great balance of peat smoke and sherry fruits/sweetness. The sherry isn’t strong, hinting at mixed cask maturation, but the overall effect is a rich one. It’s smoky, but not quite the camp fire you get with Ardbeg. There’s oak, but not in your face like Laphroaig QC. Definitely some iodine involved in the mix as well. Palate: A rich, creamy mouth feel with a pleasant drying sensation and a bit of subtle spice. All parts of the tongue are involved in the experience. It could be stronger, though, with more spiciness. I think it would border on perfection if they could infuse a Talisker-like pepper and bottle it at 46-48%. Finish: Very long, with continued drying on the tongue, along with some sweetness. Peat smoke and dried fruits linger perfectly in the back of the nostrils. Comments: I’ve probably tried 50 additional whisky expressions since I first had Lagavulin 16. I still haven’t found a better “standard” expression, and only a couple of the premium bottlings I’ve had can equal or beat Lagavulin 16 (for my tastes). I know there are still a LOT of whiskies out there to try, but no matter what I discover in the future, this one will stand as an amazingly balanced and rewarding dram. Sure, I’d like to see it bottled at a little higher ABV, but I’m not sure they can afford to do this. It might be too good of a core expression! What would they do for an encore? I put this right below Laphroaig 30 and HP 30, with this one being a much better value. Bottom Line: Amazing balance and grace for a smoky, medicinal Islay malt. One of the very best. Score higher if: Well, 92 points is pretty high. You’re just going to have to try it and see if it’s “special” to you. Score lower if: 43% just doesn’t cut it for you anymore; you prefer a more ashy/tarry peat in your Islay malt. Value: Not cheap at $65-$90, but I have no problem with the price, as I think this tops all of the 18 year malts I’ve tried in the same price range. I compared this new 2009 bottle to the end of my 2006 Laga 16 bottle. They’re very similar, but I felt like there was a little bit of additional toffee sweetness in the 2006 version. Both on the nose and the finish. I think it was because of this that the smoke and dried fruits seemed a little more muted on the nose in the 2006 bottling. I also tried a little bit of Laphroaig Triple Wood next to the two Laga 16 drams. I really like the Laphroaig, but the sherry cask finishing just doesn’t provide quite the same level of integration and balance that the Lagavulin 16 offers. I would compare the Laga 16 and 12 year old expressions, but they’re really completely different beasts. The 12 year (most likely matured only in bourbon casks) reminds me of a cask strength Caol Ila. Much more ashy and peppery than the 16 year. Plus, the 12 year is bottled at cask strength. The 12 year is also excellent, but you need to try both. It’s not an either-or proposition. WHISKYFUN.COM by Serge has reviewed a 2009 bottle of Lagavulin 16 and gave it a very respectable 90 points. Check out Serge’s great review. I’m sitting at my laptop, trying not to allow my rose-colored glasses to impact the content of this post. You may have noticed the plethora of Chivas 18 blog posts hitting the net over the past couple of weeks. Well, now it’s my turn to pile on. A PR firm working with Pernod Ricard has been sending out samples of Chivas Regal 18 and Johnnie Walker Blue to bloggers as part of a campaign to raise awareness for Chivas as a premium, gift-worthy blend. I don’t know how I got onto their radar, but don’t you dare clue them in that I’m a second-rate hack. Getting free samples is freaking awesome! This is a Speyside-based blend, with the Strathisla distillery (bought by Chivas Bros. in 1950) reportedly playing a key role. According to World Whiskey (by Charles Maclean), Strathisla 18 is not available commercially, so Chivas 18 is the dram to have if you want some of this rarity. Nose: Have you ever had Apple & Cinnamon Quaker Instant Oatmeal for breakfast? That’s the combination of scents that hits me with Chivas 18. There is also some honey, bordering on toffee, sweetness. Towards the end of a long whiff, I get additional fresh fruits like apricots and cherries. Palate: The medium body is sweet and lightly fruity. 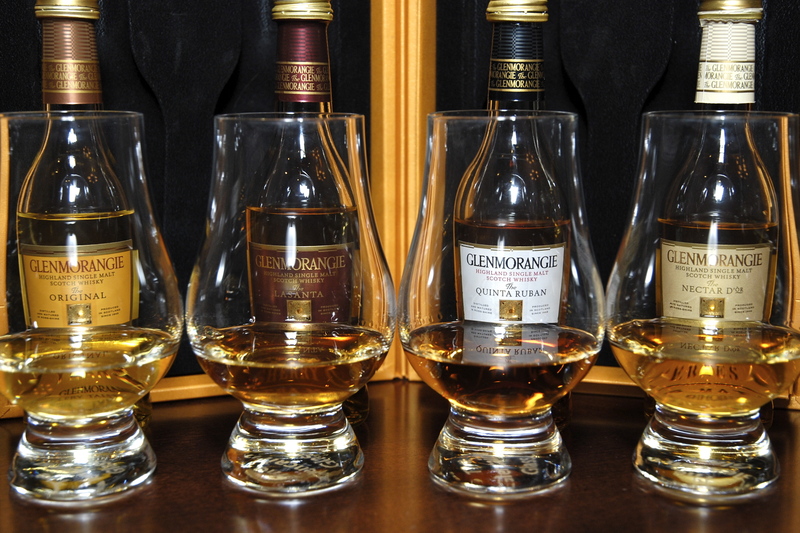 The subtle spices are so light that you’ll likely miss them completely if comparing directly with other whiskies. Finish: Subtle fruit and maltiness, along with a little vanilla. There is a delayed drying on the tongue, and no real alcohol burn to speak of. I would call JW Blue more of an “Island” blend vs. the Speyside focus of the Chivas 18. I’ve decided that there is little to gain by doing a full side-by-side analysis of tasting notes because of the different profiles. However, there are certain traits that are worth comparing. Both of these blends offer interesting noses, then yield to a more polite, accessible palate and finish. The JW Blue is especially impressive in its ability to melt away in the mouth and leave faint wisps of smoke in a way that won’t scare off the casual whisky drinker. The Balvenie FR 10 is vatted from a mix of bourbon and sherry casks, and offers a profile that is VERY similar to the Chivas 18. The nose is very close to the Apples & Cinnamon oatmeal that I described above. I don’t get the additional cherries/apricots with the FR 10, though. Perhaps not quite as much sherry influence? On the palate and finish, I think there is a little more impact and last with the Balvenie, with more spices on the tongue. I was surprised at how close these are, though. Here’s a Chivas-owned single malt from Speyside that comes in very nice packaging and seems to disappear off of the shelves more quickly during the holiday season. It’s also a key component [the primary one?] in Chivas 18. Aged strictly in bourbon casks, the profile is different than the Chivas 18 and Balvenie FR 10. However, there are some common apple and cereal notes. What I wanted to draw out is the fact that there is much more impact on the palate, and a more aggressive drying on the finish, along with some bitter/sweet interplay. Having been focused primarily on single malts during the past year, I really appreciate these stronger traits in the mouth. However, I don’t think it’s quite as safe as Chivas 18 when it comes to gifting. Q: Is Chivas Regal 18 worth $55, and would it make a good gift? A: Yes. I think it fits nicely between some of the entry level Speyside single malts and something like the Longmorn 16. 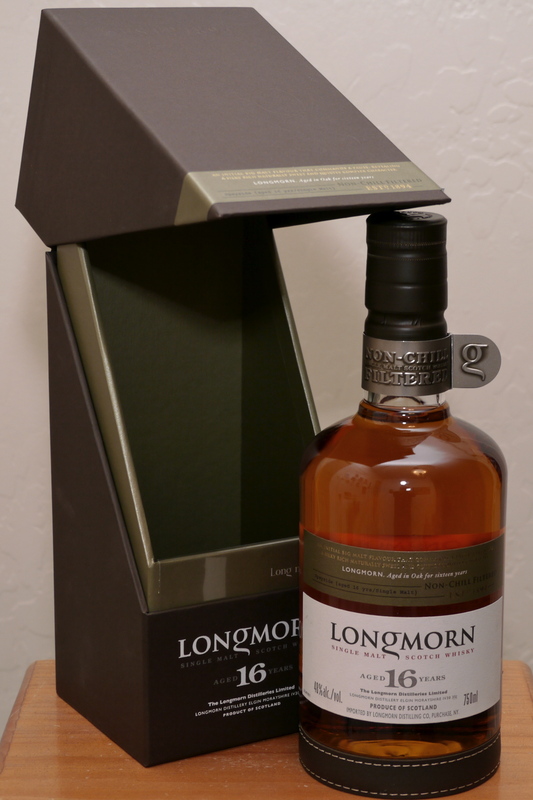 It offers an interesting nose while remaining very accessible to the occasional whisky drinker, and it comes in nice packaging (locally, anyway, it comes in a fancy gift box similar in quality to the Longmorn 16 box). I don’t think it provides much of an improvement over Balvenie 10 FR, which costs less. However, there’s often more to perceived whisky value than taste. You’re paying for the age statement, knowing that you can’t get 18 year Strathisla anyplace else, and 18 year Longmorn is also a treat. Q: Is Chivas Regal 18 a valid gift substitute for Johnnie Walker Blue? A: No. If you were planning to impress somebody with a generous gift of Johnnie Walker Blue, do NOT expect to substitute Chivas 18 and get the same results. I’m not saying this is right, or that there is a quantifiable difference in the whisky itself that makes JW Blue worth 3-4 times the price. However, there is a certain mystique associated with JW Blue that a $55 blend cannot match. I’ll touch on that in a separate post. Mystique aside, I’ll probably be scoring JW Blue a few points higher than Chivas 18 when I cover it in a separate review. There are also plenty of reasonably priced single malts that I have scored higher than either of these very pleasant blends. That doesn’t really have anything to do with the perceived value of the Chivas, though. 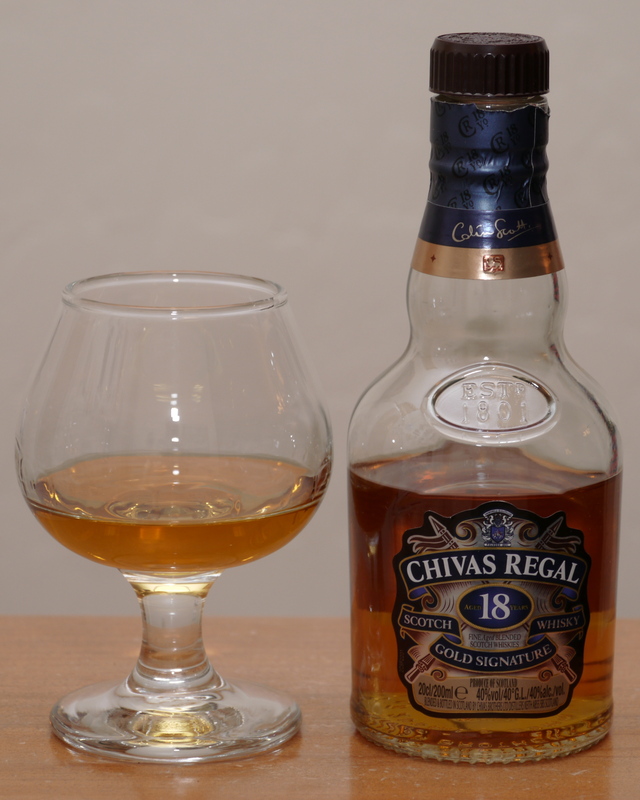 If somebody gave me a bottle of Chivas Regal 18 for Christmas, I’d be very appreciative, and it would likely be a part of some good times with good friends in the coming months. Here are a bunch of links to other blog posts resulting from this Chivas vs. Johnnie Walker campaign. Happy reading! Caol Ila has historically produced their whisky primarily for blends, with the regular CS, 12 and 18 year single malts having just been introduced in 2002 [according to the Malt Whisky Yearbook]. Caol Ila is a key component of the Johnnie Walker blended whiskies. While their bread and butter is a peated malt (I love the 12 year), I guess Caol Ila has been experimenting with low/no peating for quite some time. Perhaps some of that was put into blends in the past, but their first unpeated single malt offering just hit the shelves as a special release in 2006. For the past three years, this unpeated special release was aged for 8 years, as opposed to the 10 years of the 2009 release. Disclaimer: I’ve been reviewing all of the cask strength special releases at full strength. In this case, the CI 10 smells great at full strength, but pretty much burns the taste buds right off my tongue. I’m going to provide my notes based on adding 1 part water to 4 parts whisky. According to my handy dandy Easy ABVs iPhone calculator, that brings it down to about 53% ABV. The great thing about CI Unpeated is that it holds up very well when adding water. Nose: Lemon drops as the primary component, followed by rich vanilla cream and some fresh oak. With a little more time, the oak seems to turn into spices (nutmeg and ginger?). Palate: Thoroughly entertaining. Fizzy lemon sherbet turns to ginger powder (and possibly white pepper). My tongue is all kinds of tingly. Finish: Lemon and vanilla, with a return of the oak for a medium duration, while the spice continues to linger for a while. My top two goto whisky experts for notes and opinions, Ruben at WhiskyNotes.be and Serge at WhiskyFun.com, both gave the CI 10 Unpeated a good score, but not a great one. This certainly isn’t the most complex whisky out there, and I can understand the desire to mark it down a little because of that. Fortunately, I’m not a whisky expert, so I’m going to unapologetically state that I love this CI Unpeated. Sure, that wonderful Caol Ila coal smoke is gone, but the citrus is there, and it’s balanced with just the right amount of sugar and spice to make everything nice [that’s right…I just said that]. The fizzy lemon and spices make for a party in the mouth, and I can’t find anything “off” in the entire experience. This instantly became one of my favorite whiskies, and the bottle is disappearing fast. Score: I’m going to say 89 points for now (same as Port Askaig 17). It could go higher. Rate it higher if you’ve tried and loved some 15-20 year Rosebanks but wanted more excitement on the palate and finish (and fewer floral notes). Rate it lower if you need high complexity to get close to 90 points, or if you require peat. Caskstrength.net – They divided their coverage into three posts. They covered this Caol Ila in the third one. I also sent a sample of the CI Unpeated over to Jason at WHISKYhost, and his notes have a lot of similarities to mine. I don’t think he likes quite as much as I do, though, based on his reference to Cragganmore. Well, it’s official. Kilchoman is the 8th distillery currently producing whisky on Islay, and the first new distillery to do so since the 19th century. 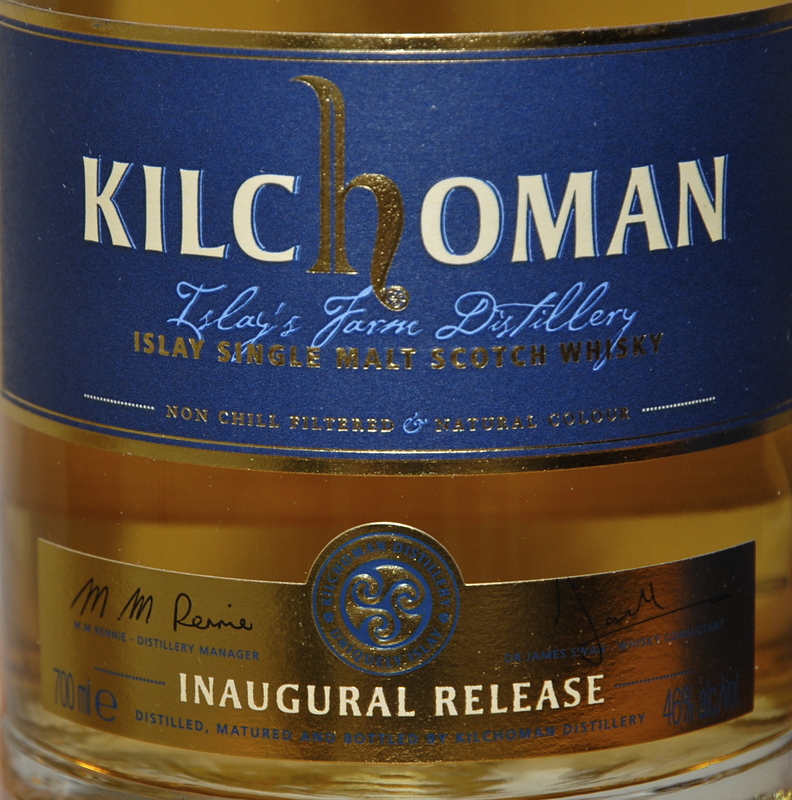 On September 9th, they had a release party for the Kilchoman Inaugural Release 3 year expression, and it hit the stores on the 10th. The UK online retail portion of the approximately 8500 bottles released was sold out within a day. Fortunately, I managed to get an order placed first thing. The 3 year is bottled at 46% after spending 2.5 to 3 years in bourbon barrels from Buffalo Trace, followed by 5 months in oloroso sherry butts. The barley is peated to 50 ppm using the same spec as Ardbeg. Upon first opening the bottle, I held the cork up to my nose and got a wonderful pure peat blast that quickly faded as the spirit evaporated away. Mmm…peat. On the nose, there’s no doubt about the use of heavily peated barley. There is a combination of peat and smoke that stands out above anything else. It’s a pure, earthy peat and ashy smoke. No tar or iodine to speak of like Ardbeg or Lagavulin respectively. There is a fair amount of vanilla on the nose as well. When I opened the bottle two days ago, I thought there was an eggy or rubber component. That has calmed down, with maybe some cereal notes remaining. With a few drops of water, fresh pine and a little citrus come out, reminding me a little of Bruichladdich. The palate seems pretty simple, with sweet peat and a little pepper after I chew on it for a few seconds. It’s a little hot, but I wouldn’t call it rough. On the finish, the pepper remains and builds on the tongue. The ashy smoke and peat come back in full force, with the smoke hanging in the back of the nostrils for a long time. Again, no tar or iodine, just peat smoked barley in liquid form. BIG peat finish for the peat lovers. The notes on the back of the bottle talk about rich dark fruits and citrus. 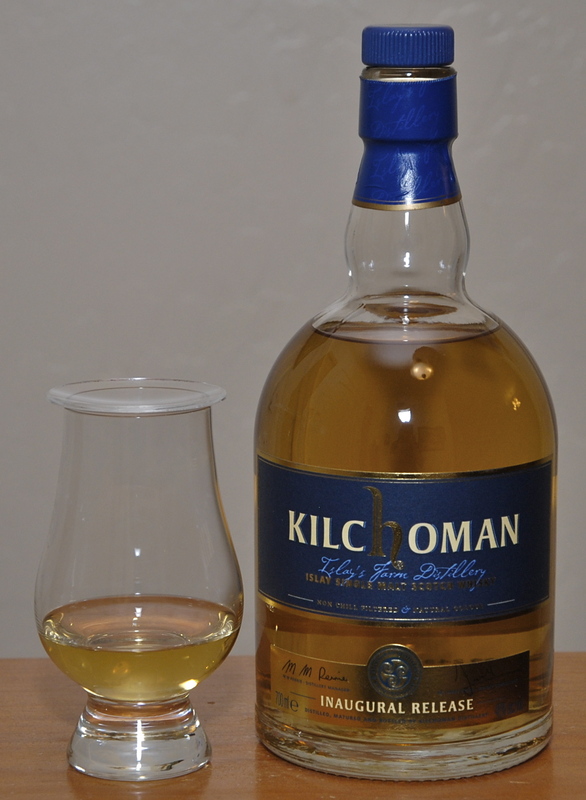 After comparing this to Longrow CV, Caol Ila, and Benriach Arumaticus Fumosus, I just can’t call the Kilchoman “fruity.” It also took water and time to bring out a little citrus, whereas I felt there was much more noticeable lemon on the Kilchoman 2 year New Spirit. I wonder if the 5 months in sherry butts actually killed off a little of that fresh citrus scent. 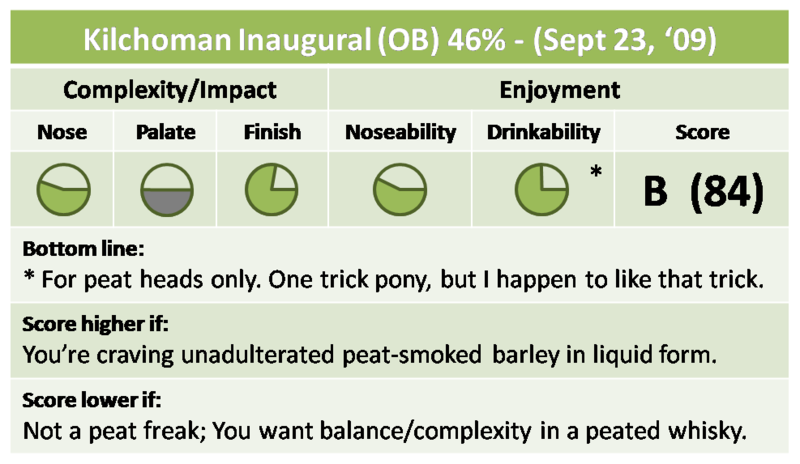 As for the peat and smoke, I would liken that part of the profile more to Bruichladdich 3d3 or Bunnahabhain ‘Moine’ than Lagavulin, Ardbeg or Laphroaig. 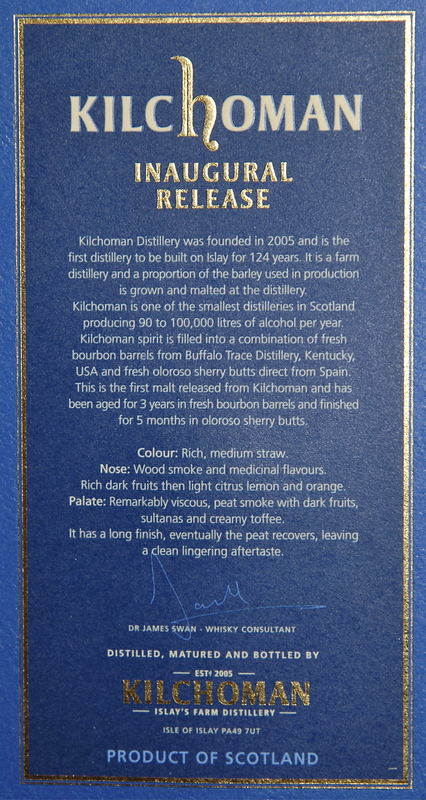 It’s officially “whisky” now, but the 3 yr. is not a huge leap from the Kilchoman New Spirit that I had previously tried. It’s clear right from the start of the nose that this is a “big peat” whisky, and it doesn’t really offer anything surprising from that point on. However, the peat smoke is very “clean”, with no real sour notes to detract from the experience. The big, peaty, smoky finish is very enjoyable and lasts for a long while. Heading into the finish, this seems like a “nice” 81 point whisky, but then the pepper hits, the peat builds, and the smoke lasts and lasts. By the time it’s all over, and the bonus points are tallied, I’ve got a big smile and an 84/100 point rating to hand out. This finish really speaks to me, but I can’t rate the whisky up with the likes if Caol Ila 12 or Ardbeg 10. 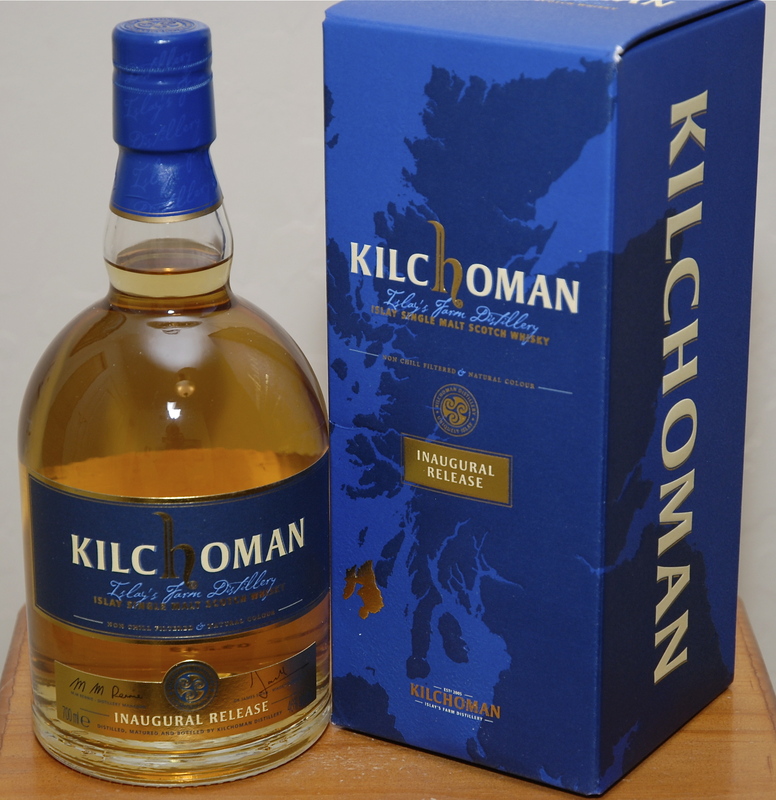 With more maturity and complexity, I can imagine some pretty high scoring Kilchoman releases in the future. Ralfy has already posted a video review of this expression. He really liked it and gave an 89/100 point rating. Hmm…two ratings a bit higher than mine. I wonder if I’m being a little stingy just based on the theory of this being a 3 year. Oh well…doesn’t matter. I think we’re all sending similar messages. Plus, Ralfy is right that this is a one-trick pony. If that trick doesn’t float your boat, you’re going to really wonder what all of the fuss is about. [Update 2] Finally, a dissenting vote. 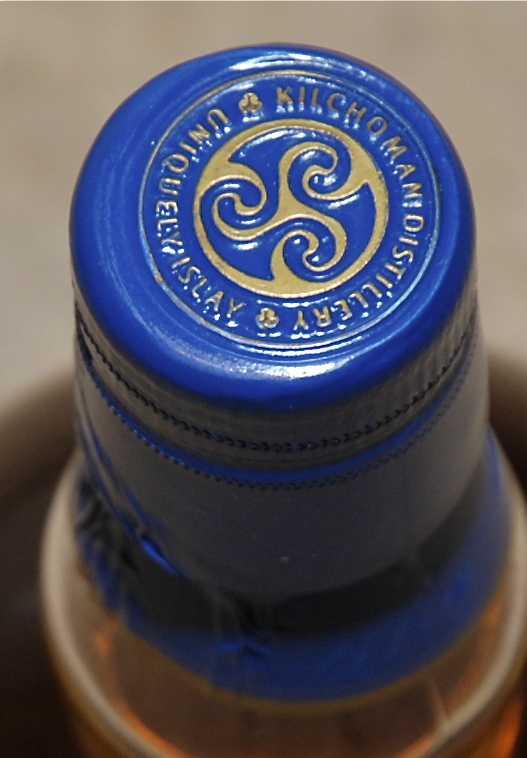 Ruben just posted his notes on WhiskyNotes.be, and awarded a mere 79/100 points. Actually, I don’t find his notes all that different. I just happen to personally get a lot of pleasure out of the one-note finish and awarded points for that. I suspect there will be a lot of people out there who agree with Ruben (if they can get their hands on a bottle). White Horse Extra Fine 12 year blend. Fine indeed. There is a liquor store between home and work that sells a lot more beer kegs than whisky, but they do have a pretty good selection of the good stuff, including some bottles that have been sitting around for several years. I stopped in to look for something I can’t find at my usual haunts, and saw a few bottles of White Horse Extra Fine blended scotch sitting on the bottom shelf. I haven’t seen this anyplace else, and I thought I had heard good things about White Horse on the whisky forums. It’s aged 12 years, bottled at 40% ABV, and priced at $33. I picked up the box, and read that “the powerful, smoky flavors of the aged Lagavulin combine in perfect harmony with the mellow, rounded character of Glen Elgin and the sweet aromatic flavors of Craigellachie to produce an outstanding quality Scotch Whisky for the truly discerning drinker.” A blend based on Lagavulin? Sold! I had to try a bottle. On the nose, I immediately pick up signs of sherry cask aging. There are dark fruits (prunes) and figs. It’s not a sherry bomb, reminding me more of single malts that are 40-50% aged in first-fill sherry casks, like some Highland Parks and Dalmores. Also hinting at some sherry aging is a light sulfur presence. Not enough to turn me off, though. Finally, there is a pretty strong toffee sweetness. Sometimes I thought I picked up hints of smoke, but then it would disappear. I also thought there was some orange, until I tried it next to Dalmore 12, then I wasn’t so sure. Orange came out in the Dalmore and disappeared from the White Horse in the comparison. On the palate, it’s very sweet, and quite mild. It does, however, have just a bit of pepper that builds after a couple of seconds, and some hints of spices like ginger and cinnamon. 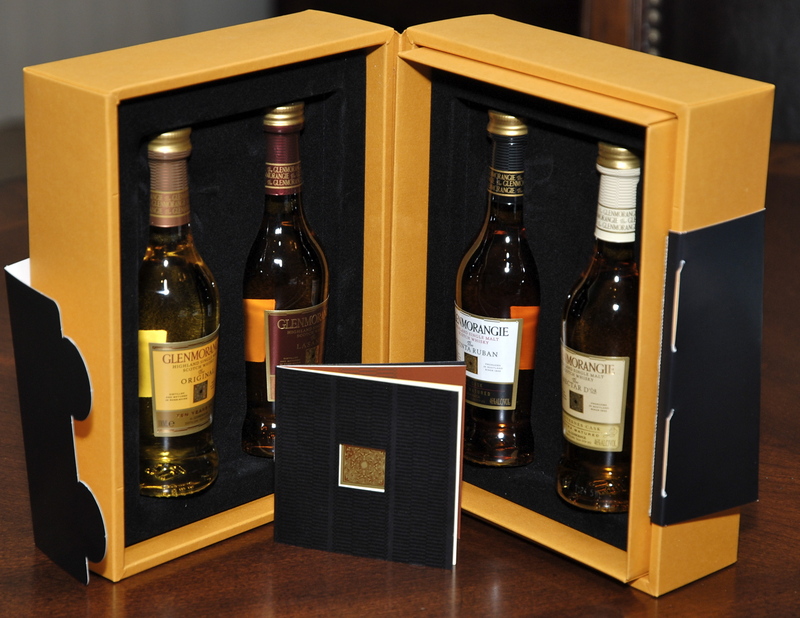 That’s a nice touch, but it doesn’t compare to higher proofed, stronger tasting single malts. The finish is short to medium on the tongue, but there’s still a little pepper and some pleasant drying, along with a slight malty presence. There’s also just a little bit of “grain aftertaste” on the back sides of the tongue that I seem to get with most blends (and vodka). Meanwhile, some smoke finally makes an appearance, enveloping the fruits from the nose and hanging in the back of the nostrils for a medium period of time. You’ll note that I didn’t say anything about Lagavulin similarities in the tasting notes. That’s because there is nothing even remotely resembling the iodine and smoke that makes Lagavulin so recognizable. So, I must have been terribly disappointed by this blend, right? Quite the opposite. 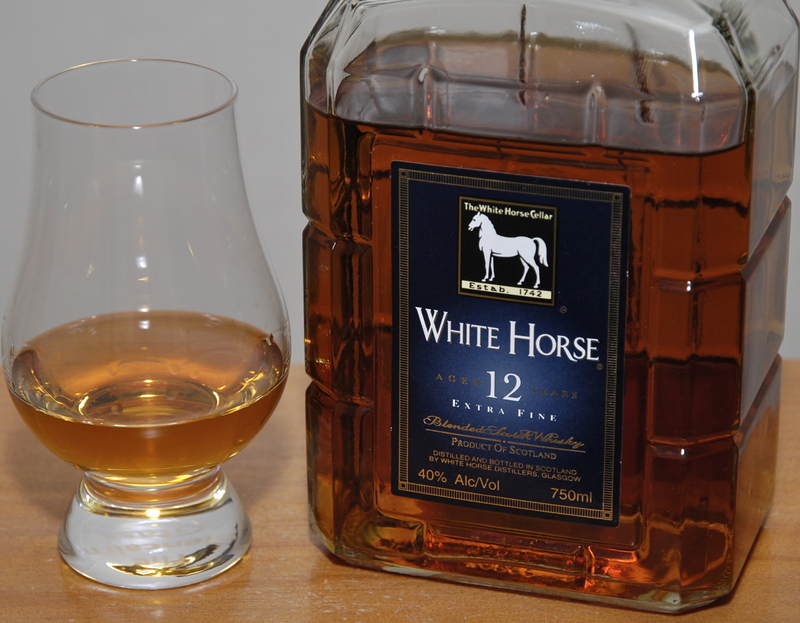 White Horse 12 year just shot to the top tier of my blended whisky list. I really enjoyed the sweet, fruity nose. It was perhaps the closest to a pure malt that I can recall in a blend. I’m also a big fan of mixed sherry/bourbon cask whiskies, so my impression of this being similar to HP or Dalmore in this regard fit right into my preferences. Finally, the palate and finish were just interesting enough to keep me coming back for more, and there wasn’t much in the way of detractions. One thing lacking was much of a wood influence, which I look for (not too much, though) in a fully balanced whisky. Overall, this is a very good whisky, and not just for a blend. I highly recommend trying this if you can find a bottle. I’d rate this 85/100 points for having lots of good points and very few bad ones. To rate it higher, the palate/finish would need to be a little more interesting, and I would want at least some level of noticeable wood influence. I can’t find White Horse Extra Fine in any of the larger liquor stores locally, or the online stores that I frequent. I’m not sure if this isn’t made anymore, or if it’s just primarily sold in other markets. I also can’t find any reviews in the whisky publication online sites, or the better known blogs. If you’re familiar with this particular blend, I’d love to hear your thoughts in the comments. I’d also be interested in hearing about any “official” reviews out there. This seems too good to go completely unnoticed. Or maybe I’m just too easy to please. LA Whisky Society: Type “White Horse” into the search box at the top of their main page. A couple of the LA Whisky Society members rated Extra Fine 12 year. Their minimal notes are a bit different from mine, but they do give it a B+ rating. Whisky.com: A page dedicated to the White Horse blends. 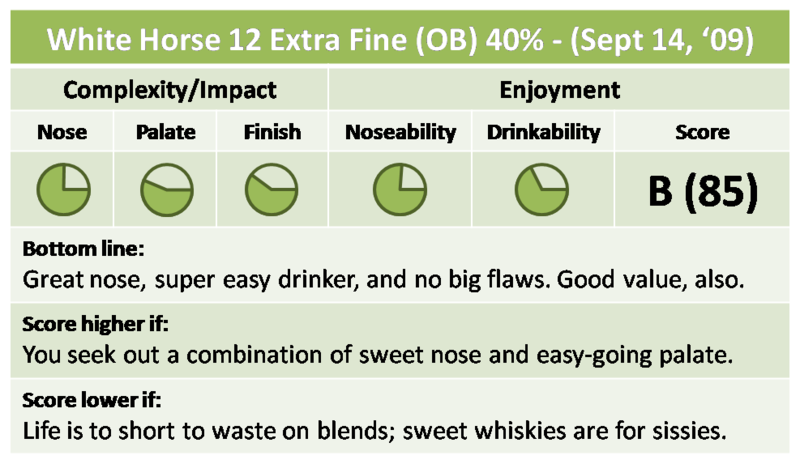 The text from the box of 12 year Extra Fine is included, and check out the links to the distilleries that are used in the White Horse blends. While I didn’t find much to remind me of Lagavulin, I can certainly believe that Glen Elgin and Craigellachie play a significant role in the flavor of this blend, based on the distillery profiles. You can read about my attempt at a rating system here.